just wondering if any one has ever tried spinning for seatrout at night with a mepp,the little river beside me is difficult enough to fish with a fly during the day and impossible at night. Hi John - the humble mepps has given me a lot of pleasure over the years - especially for seatrout on certain rivers and burns. In my experience 'first light' is by far the most successful time for this heinous practice with the evening being noticeably less so. It should go without saying that daytime fishing for sea trout, unless fishing a high and coloured water, would be as close to a waste of time as you could get. As for the nocturnal stuff - tried it MANY times but with limited success. Definitely an early morning 'thang'. Why not carefully get in aboot yer wee river with a pair of loppers and open up some pools for the flee ? .... or, alternatively, stick yer rod through the bushes and trot a wee brandling worm over them. Where is your "wee river" - or is that a closely guarded secret ?. Never heard that one marty - although it might be 'local' rule on some waters. There may be an EA byelaw "up there" but there certainly isn't "down here". I think one of the Teign clubs bans it though. I know a couple of folk who have tried it on small rivers and both hit the same problem, the opposite bank and trees! Both said it was very difficult to place the spinner accurately in the dark. I've never tried it because, like STip, I find spinning in the evening pretty unproductive anyway. I find daylight spinning in clear water a very good way of finding sea trout, they come out of everywhere to follow the spinner and have a good laugh at it Numbers hook are pityful even when they are very fresh and I spin very very fast. If it really is that difficult to fly fish at night and you can't trim it out you could always try the nymph or dry fly by day/dusk. Good point about "finding sea trout" Andy. I used to send a wee mepp's upstream into the throats of pools a couple of hours before the onslaught of darkness and, as you rightly say, often fish would follow - but not with enough conviction to 'have a go'. Not a problem as the object of the exercise was simply to establish what was there in order to nail them after dark on the flee. not something I've tried myself, but I know that upstream spinning with a Quill minnow is very productive for sea trout on rivers like the Towy and Teifi - not a night, but certainly in day/evenings. It's certainly banned at night by the Upper Teign FA, not sure about the Lower. Plenty of decent fly water though. As a teenager in the late 1950's, I often saw on old guy in his sixties spinning for sea trout with a natural minnow mounted on an Archer tackle. He'd start fishing around 10.30 and he usually left about 11pm with a couple of fish. One one occasion while fly fishing in a coloured water in the daytime, I watched they same old guy and his two sons on the opposite bank. All three were spinning with natural minnow mounted on an Archer tackle and between them, they landed around 20 sea trout in just a couple of hours. I learned later they used to sell their catch in the local market. In more recent times, I've seen anglers fish with Quill minnows in a summer spate for sea trout. Casting upstream and retrieving quickly. 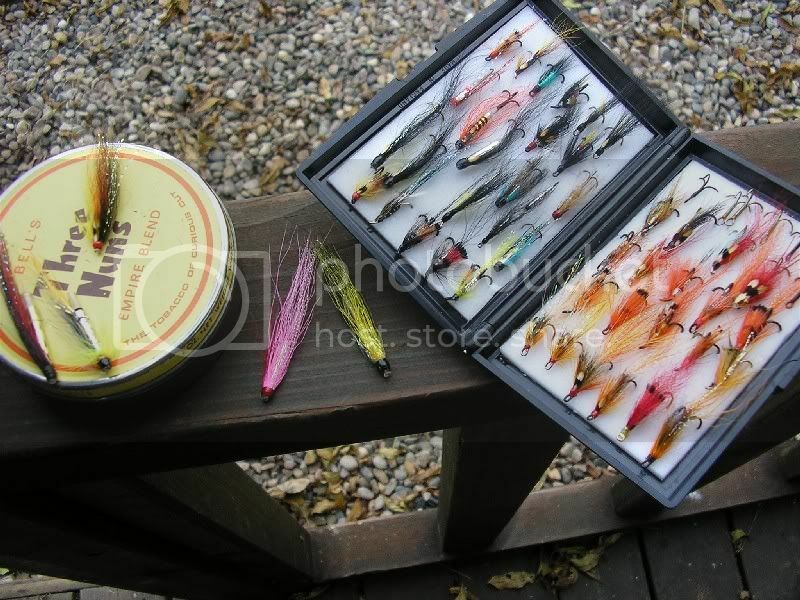 Hi BB - strange that, isn't it ?, how sea trout will chase (and take) a variety of upstream lures - small Toby's, Mepp's, Quill / Lane minnows and, shrimps ..... but very rarely an upstream flee - no matter how quickly it is retrieved, or thats certainly been my experience over the years. I wonder if its that the fly line itself is more inclined to spook fish due to either the false casting process necessary to get the flee upstream or, quite simply, the bulkier profile of a fly line as it hits the water - I prefer the words "settle down gently" but you know what I mean. Maybe its that the human hand cant retrieve (no matter how deft your finger work or hauling ability might be) the necessary and continuous rates of retrieve required to make this technique effective ? - certainly in comparison to the use of a fixed spool reel. Apologies if this digression back to the upstream flee has been discussed in another thread - will check now. Aye Andy , the flowing water v canal scenario had crossed my mind ,but thought I'd leave a bit of space for some repartee ;D.
certainly caught on a wee spoon fly at night , don't see why a wee mepps wouldn't work as well! there is another way you could try and I have only tried it myself a few times....and caught! Get a couple of tiny flicker spinners, (fly spoons/ fly spinners), I got a few from USA but i have seen them here too, Hildebrandt I am sure. You can flick or cast them out with a fly rod. Use a short leader and strong nylon, maybe 10 lbs or so, try to find broken or pacey water and fish as you would a team of flys, across and down and hold on tight!